The last waltz class had fun. One last session this spring. The next 6-week class runs March 27 thru May 1 from 7:oo-8:oo pm. Garnett teaches with assistance from friends like Rick Martin and Ken Mann. Register at www.Charlottesville.org/ParksandRec. 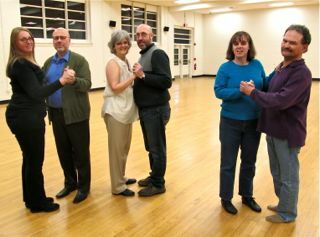 The spring open waltz events will be held March 20 and May 22 from 6 – 9 pm at Carver Rec Center. Community dance. Bring your friends.